Waits is in kindergarten! Which means (among other things) that we are now sending complete lunches to school every day (as opposed to one big “share snack” like we did at preschool). I’m aiming for homemade, whole-foods-based vegan lunches (with some snacky stuff thrown in there – this is real life after all, and we’re all busy people!) packed in re-usable, earth-friendly containers. My plan is to share his lunches with you guys in periodical round-ups, featuring both the food I send and the containers I send it in. 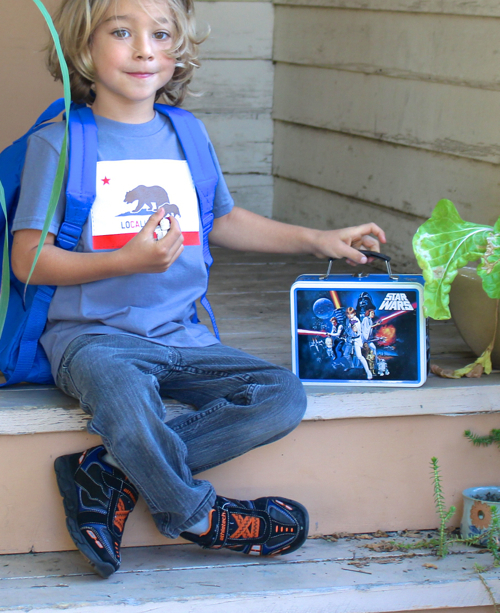 Here’s a horrible cell pone pic of the very first lunch I packed, for his very first day of kindergarten. I promise the pictures in future posts will be better! 2 healthier “oreo” cookies, because it’s the first day of school! I’m really looking forward to sharing this new series with you guys. I’ve also created a Pinterest board where I’m pinning ideas, inspiration, healthy lunch foods, and eco-friendly lunch containers. Follow the board to see everything I find! That meal looks so delicious and healthy! Way to go, Sayward! I use to LOVE the blog Vegan Lunch Box! I’m really excited to see your version of it with these posts! That TIE fighter pizza is awesome! Coolest healthy lunch at school for sure! That is super cute and I’m impressed that he would eat that much food in a single meal! My girl (same age) is too social (ie, talkative) to sit still and eat that much food at lunch – many days lots of what we send comes home, and she tells me she “didn’t have enough time.” Whatever. But anyway, one of her favorite lunch meals is a sandwich on homemade wheat bread, spread with hummus and either sliced cucumbers or shredded carrots (and maybe someday, both!) – and of course a veg and a fruit. 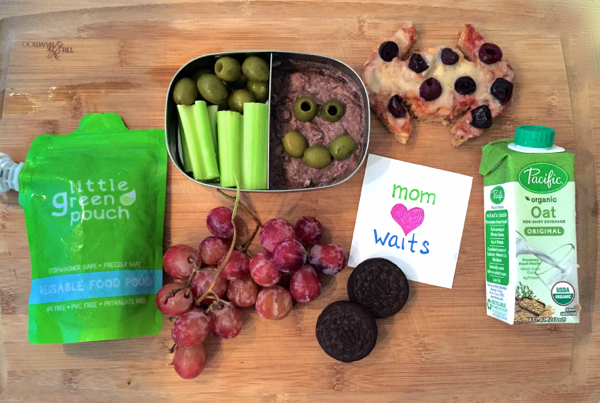 Sage’s school is nut-free and sugar-free, so lots of snacky-treats and nut butters are out (she used to like sunbutter but has changed her mind on that – and I agree, stuff is nasty!). Other decent options for us have been a few slices of quesadilla with guacamole to dip in, a bowl of chickpeas with pasta, and sometimes she’ll do ok with leftovers of something like a rice-quinoa-lentil dish from dinner the night before. Yay!! One of the first blogs I ever started reading was Vegan Lunchbox way back in 2007. And even though I don’t have (or want) kids, it made wish I could pack someone’s lunch!! It looks so fun! We love olive hummus in our house, too! Looks like an awesome lunch… super excited about this (and future) lunch posts. Btw-did you make the “oreos” or find them somewhere? Awesome! I was just wondering, would you otherwise be pouring the oatmilk from the package/carton (however it’s called) into the stainless steel bottle? :D Or I guess you’d just fill the stainless steel bottle with homemade milk or water or something? Have you used the Little Green Pouches before, and if so, any tips on washing them? I’ve been using them off and on for a couple years and have found they are a Royal pain to clean up. Even in the dishwasher they get yucky crud in the bottom crevices. I’ve given up because there are times I’ve washed them numerous times and the debris I still there, and I refuse to put the kiddo’s smoothie in a dirty container. Please, please keep safe. I don’t think whole, un-cut grapes are safe–I think they are too much of a choking hazard. Please do your own good research and keep yourselves and kids safe from choking, food poisoning, allergens, etc. Please take care. I’m sorry, I just don’t want you to come to harm. Please keep safe.